I hope you got a chance to enjoy the bloghop this weekend! My card this morning uses my first test-colored image that I showed on the bloghop; I usually color one before shooting the video, and I figured since we kept our posts simple (and that meant not embedding the video! 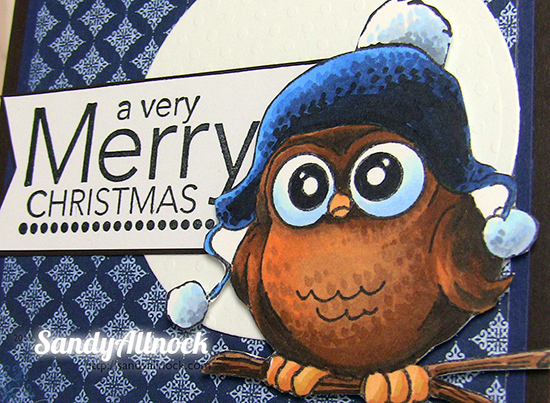 ), I’d make another card with my lil whoot…and share the video for those who missed it! I used the same papers, same colors…but this time he’s simply against a circular moon – and I made it a Christmas card this time. 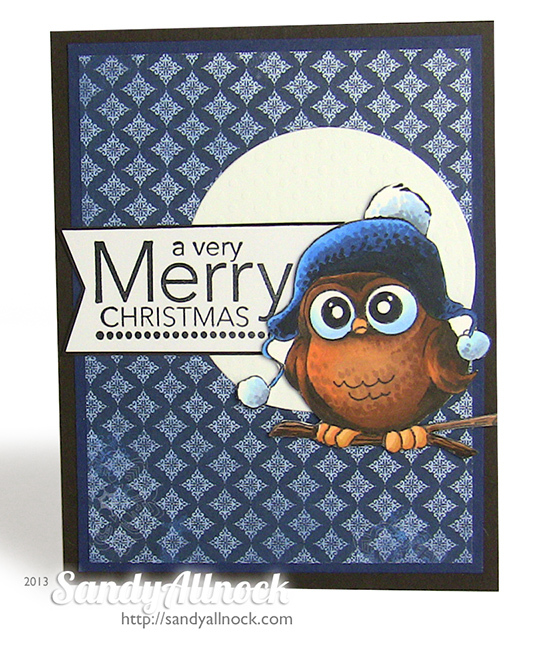 Sandy, I use copics and have colored with Neenah, copic paper from Make-It-Crafty,Some Odd Girl has a wonderful paper for lots of layers that she gets from Australia, used Copic paper from Hollo’s in New Brunswick Ohio, Gina K copic paper, and X-press-it. I think I am missing something. Neenah I only use for practice because I get bleeding. All of these papers I use with black and white laser.